Navy Times talked briefly to former Aviation Storekeeper 3rd Class Fred Stroman a few weeks back when we found out he’d be graduating high school — just a few years late. Stroman enlisted in the Navy in 1964 while in high school — young enough, he said, that his mother had to sign the paperwork. When he was told he’d be a half-credit short of graduation, he “was so upset that I left school that day and went to the reserve center and told them that I was ready to start my two years of service,” he said in a school district news release. Fred Stroman, in his Navy days. So into the service he went, starting at submarine school before serving on aircraft carriers, including a deployment to Vietnam. He served until 1968 — recalled to active duty briefly, he said, as part of the Navy’s response to the seizing of the research ship Pueblo by North Korea. Stroman, 65, went onto a career in the postal service. Since retired, he speaks at churches in Missouri. The high school diploma he’d never received never really bothered him, he said, until he saw his own children earn diplomas. Thanks to his service, an answer was available. Texas law allows service members who never graduated because they joined up during wartime to receive diplomas so long as they were honorably discharged. He sent the Pasadena Independent School District his Form DD 214, and they began planning a rare event — a homecoming ceremony with a graduation in the middle of it. 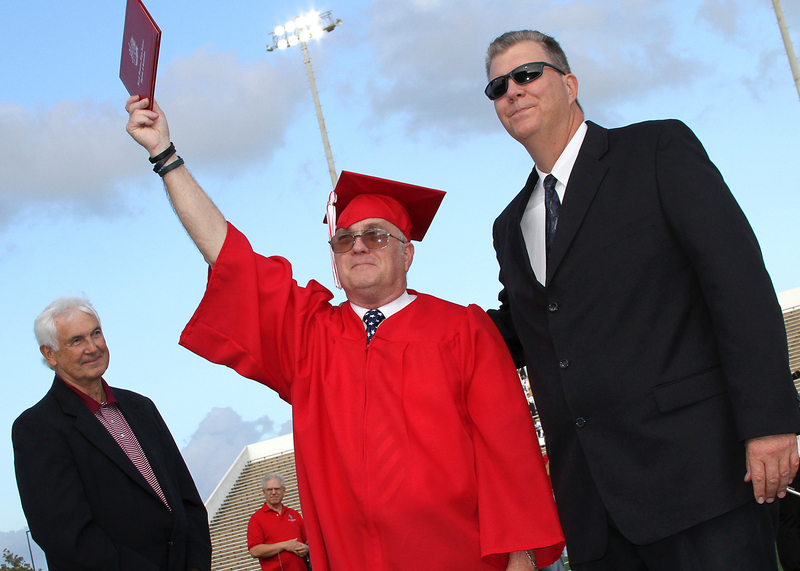 Before Saturday night’s football game against Sam Rayburn (don’t let the result spoil the story), Stroman donned a red cap and gown at midfield and walked to the sideline, accepting his diploma signed by Sam Houston principal Steve Fullen — who was about old enough to start kindergarten when the rest of the Class of 1965 was around. I was at the South Houston vs. Sam Rayburn game to see Fred get his diploma! It was great to have him realize his dream! I was at the game and ceremonies as well. This was a wonderfully inspiring event that topped off the incredible homecoming weekend at OUR alma mater. I was there with tears in my eyes, and was part of the effort to get Fred his diploma. It was a great honor to see it happen. We love you, Fred!